With close to 300 million people, and a GDP that for the first time last year hit USD$1 trillion, Australia has been quick to take notice of its Indonesian neighbour. But how has Canberra handled a country whose relative proximity belies its stark dissimilarity? Recently in Jakarta I was asked to compare Australia’s relationship with Indonesia today with that under the New Order. During the New Order, our problems derived mostly from Timor and from the different backgrounds of our countries. Our leaders generally tried to steady the relationship, and Keating and Suharto sought to strengthen it. But, Australians saw Indonesia as militaristic and corrupt. To Indonesians, Australia was a country cousin of the colonial powers but without their political savvy. These perceptions affected how we dealt with each other. When Timor fell off the agenda and Indonesian democracy sprung open, the relationship arguably became more equable. It also became more complex. Border issues, combatting terrorism, economic dealings, education and so on are constants in the relationship. However, it is increasingly shaped by four overarching factors, discernible in 2000, but now more pronounced. First is the rise of China and the relative decline of the United States. 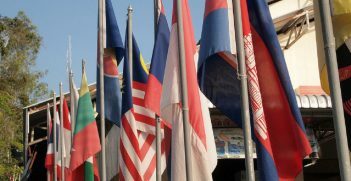 From the beginning of the New Order, Indonesia’s importance to Australia in regional security terms was as a stable and pivotal member of ASEAN, it contributed to a benign security environment in South East Asia. But the guarantor of Australian security was the United States. It still is. 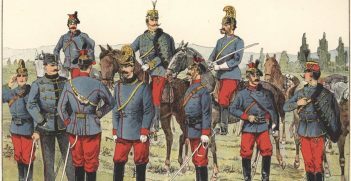 But, as doubts have grown about the durability of the American commitment to the region, so too has the view that regional security will increasingly revolve around a multipolar power structure in the Asia-Pacific and around closer security relationships between the more significant regional nations, of which Indonesia is one. Indonesia’s security doctrines are self evidently different from Australia’s. While Indonesia sees advantage in the United States’ presence in the region, it takes non-alignment seriously and eschews a public embrace of the United States. Indonesian attitudes on Chinese economic activity in Indonesia can be sharp, and as happened during the Ahok affair (involving the imprisonment of the ethnic Chinese Christian governor of Jakarta for blasphemy), some groups tie in Islam with economic nationalism. Such approaches impact on dealings with China. In a more strictly security context, Indonesia is nervous about Chinese militarism, but it is less so than the Australian security establishment, and it is hesitant to criticise Chinese behavior in the South China Sea. 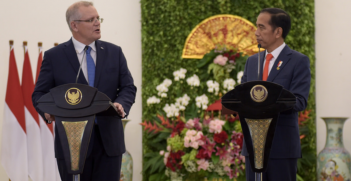 This mix of attitudes suggests that Indonesia will remain cautious about the scope of its security relationship with Australia, but will be more open to substantive dialogue with Australia about regional security issues. This could lead to greater propinquity of perspectives on how best to deal with regional threats. The second factor is the importance of political Islam. The divide between those Indonesians who want an Islamic state and those who favour a broader constitutional structure has always been central to Indonesian politics. But, since 1999, all parties have accommodated increased popular sympathy for Islamist perspectives and the Islamist factor in Indonesian politics has become more pronounced since the Ahok issue. How Indonesia governs itself is Indonesia’s business. But it is not in Australia’s interest for Indonesia to swing more towards radical Islam if only because the latter breeds anti-western sentiment, and ideologically Australia is in the west. Australia therefore needs to think about its attitude towards Islam, and particularly how best to use what influence we have with Islam in Indonesia. One approach might be to deal with a wider spectrum of Islamic opinion in Indonesia than in recent years. It is usually best to engage rather than avoid those with whose ideas we disagree. We must also recognise that neither we, nor anyone else, can disaggregate our policies towards the region from other policies, particularly on the Middle East. A clear example of how polices towards one region affects those towards another is Trump’s Jerusalem decision, which has had a negative impact in Jakarta. Although Australia abstained rather than supported the United States in the United Nations vote critical of the Jerusalem decision, the issue should be a reminder that an unsympathetic voting pattern on issues of importance to the whole of the Islamic world, particularly where we do not have a direct national interest in adhering to that pattern, has an adverse resonance in our own region and hampers our capacity to influence thinking there. Third is the impact of democracy in Indonesia. It has not eradicated issues deriving from its cultural divide with Australia. During the New Order, the relationship was brittle but had predictability. The relationship became more volatile as Indonesian public opinion increasingly influenced government policy after 1999. In one sense Indonesian democracy has made the relationship harder to manage. That said, Australia only loses from a regression in Indonesian democracy. Democracy requires more than a fair voting system. It is about strong institutions, adherence to precepts and protection of rights. If progress in these areas suffers setbacks, as has happened in recent years in Indonesia, the scope for the rise of an Indonesian Erdogan increases. It is for Indonesians to manage Indonesia and there is no magic wand to wave over Indonesian democracy. But we should support those Indonesians who are trying to protect the democratic structures established in the aftermath of the New Order. Finally, the asymmetry in the relationship favouring Indonesia is more pronounced. Indonesia sits astride Australia’s northern approaches. It is central to the regional structures we seek to influence. We do not have an equivalent strategic importance to it. On a purchasing power parity basis, most estimates suggest that in 2030 Indonesia will be between the world’s 5th and 8th biggest economy. We will rank in the mid 20s. These asymmetries are not necessarily a minus for Australia. A strong and wealthier Indonesia will contribute to strategic balance in the region and could benefit us if we develop an effective economic relationship with it, particularly by using our assets in innovation and technology. But we will need to compete to get attention in Jakarta. John McCarthy AO FAIIA is currently Chair of the Australia-India Council, Deputy Chair of the Australia-India Institute, Chair of the Advisory Board of the Griffith Asia Institute and Co- Convenor of the Australia -Indonesia Dialogue. He is a former National President of the AIIA.